Hawaii photographer Al Chang took this renowned Korean War picture of Army Sgt. 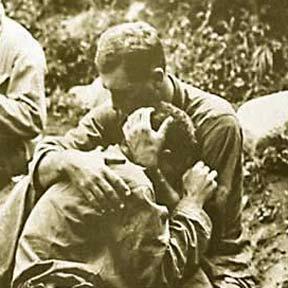 Bill Redifer comforting fellow soldier Vincent Nozzolillo upon learning that a buddy who had taken his place had been killed. After a long search aided by the Star-Bulletin, Redifer's daughter-in-law has secured a high-quality print of the photo, which she will present to her husband tomorrow.